"Bergman's excellent stories are hard-earned and well-honed. Her characters speak as if their very lives depend upon getting it right, getting it down, facing the toughest stuff that tumbles down with equal toughness and enduring resilience. A very fine and impressive debut." How much of a role does nature play in the lives of the heroines of Mayhew Bergman’s stories? How do their relationships with the natural world affect their decisions? In “Housewifely Arts,” what did her mother’s parrot represent to the narrator while her mother was still alive? How did the parrot’s importance change after her mother passed away? How did you react to the veterinarian husband in “The Cow That Milked Herself” examining his pregnant wife in the same way he examines animals? Do you think his clinical take on his wife’s pregnancy reveals any universal truths about motherhood? “For centuries people had used the swamp to hide from their problems” (41), says the narrator of the title story. Does Mae use the swamp to hide from her own problems? If so, how? How does her father’s scare in the swamp change her priorities? Lila feels ugly and damaged after her face is disfigured in “Saving Face,” and goes to great lengths to isolate herself. How do you think her experience with Romulus and the sickly calf will change her? Can she reclaim the person who she was, despite her new challenges? Lauren, the population control activist in “Yesterday’s Whales,” has a crisis of faith when she becomes pregnant. Have you ever experienced an event that’s challenged your long-held convictions? Is there any way to reconcile two wildly different points of view? Do you think the narrator of “Another Story She Won’t Believe” realizes the mess she’s made? What do you think propelled her to self-destruct? Do you think her treatment of the lemurs represents an insurmountable character flaw? What does it take to forgive yourself after an act of negligence? What kind of mother do you think the narrator of “The Urban Coop” will turn out to be, if she can become pregnant? “My mother once told me: Never underestimate avoidance as an effective coping mechanism,” says the narrator of “The Right Company” (146). Is her retreat to the small Southern town of Abbet’s Cove an effective way to deal with the collapse of her marriage? When she tries to free Mussolini’s dog, the animal refuses to make an escape. What does this juxtaposition say about the narrator’s circumstances? In “Night Hunting,” a young girl must come to terms with her mother’s declining health. How does her walk through the cold Vermont night force her to confront her fears? Do the ever-threatening coyotes represent a more primal danger than her mother’s cancer? Could a hunter and an animal lover ever have a functional relationship? Do you think the woman in “Every Vein a Tooth” uses her relationship with animals to avoid the messiness of human intimacy? Or does her extreme devotion to the animals she rescues come from a purer, more optimistic place? 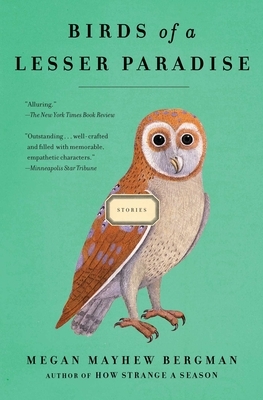 “The Artificial Heart” is the only story in Birds of a Lesser Paradise that’s set in the future. How do you think it fits in with the rest of the stories in the collection? Do you think it’s a natural impulse to want to prolong life, even if the quality of that life becomes less than ideal? Or do we become lesser versions of ourselves if we try to cheat death? The narrator of “The Two-Thousand Dollar Sock” is a fighter, as is her husband, and ultimately her dog, Vito, who attacks a bear to protect the family. Do you think humans have a similar compulsion to fight and defend?